Special Deal Available for 10 Select Performances December 5 through December 28. Manhattan, NY - November 30th, 2014 - Ride MTA Long Island Rail Road for free and get $10 off your ticket to see “Dr. Seuss’ How the Grinch Stole Christmas! The Musical” at The Theater at Madison Square Garden. The special deal is available for 10 select performances from December 5 through December 28. That’s right! 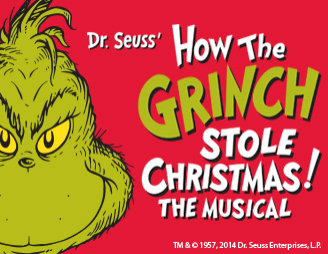 You travel round trip on the LIRR from your home station to New York City for free to discover the magic of Dr. Seuss’ classic holiday tale as it comes to life on stage in this beloved family musical featuring the hit songs, “You’re a Mean One, Mr. Grinch” and “Welcome Christmas.” The Grinch finds there is more to Christmas than he expected as this record-breaking Broadway production returns to New York City and The Theater at Madison Square Garden. • Friday, December 5 at 7 p.m.
• Thursday, December 11 at 7 p.m.
• Friday, December 12 at 7 p.m.
• Thursday, December 18 at 7 p.m.
• Friday, December 19 at 7 p.m.
• Sunday, December 21 at 7 p.m.
• Monday, December 22 at 7 p.m.
• Tuesday, December 23 at 7 p.m.
• Friday, December 26 at 2 p.m. and 7 p.m.
For More Information go to www.mta.info/lirr and click on “Deals & Getaways or call the LIRR's Customer Service Center by calling 511, the New York State Travel Information Line, and saying : “Long Island Rail Road,” when prompted. Subject: LongIsland.com - Your Name sent you Article details of "Ride the LIRR Free & Save $10 on Tickets to “Dr. Seuss’ How the Grinch Stole Christmas! The Musical” at The Theater at Madison Square Garden"